One of the Lovesail members, Gandalpuss, has written this lovely story. We always welcome articles from Lovesail members, so if you are a budding writer of fact or fiction and have a short piece to submit, contact us through the usual email address and we can arrange to publish it on the Lovesail Blog. At twenty years of age, a friend gave me access to a fibreglass sloop built in the 1950’s. Tired as the boat was – and of late neglected – her owner had not the time to enjoy the sailing of her due to the pressures of work. 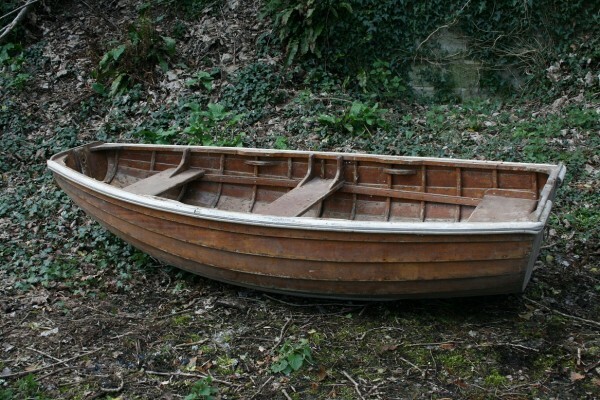 The deal was that I should repair and restore the boat as much as possible in return for the free use of ‘Maggie May’. The boat was moored in the Trieux River near the town of Lezardrieux in Brittany, France. My friend had set sail on a round the world voyage single-handed from Portsmouth Harbour. Arriving in France he had met a lady who was to become the love of his life, a much younger French woman from Lezardrieux. Except the lady was already on her way to Britain having secured a job as a teacher! Balancing the desire to continue his dreams of circumnavigation with what he saw as the dream girl, the latter tipped the scales. He settled into the routine of job, mortgage and family. I began to stop the decline in the yacht’s condition by throwing out much of what would have been useful to a ‘live aboard’. The only equipment of use from inside the yacht, apart from the tools, were six cartons of John Smiths ‘Extra Smooth’ beer. With eight cans per carton, I began gradually working my way through this obviously vital source of energy. Nodding relations soon changed to a wave of the arm as other users of the river became familiar with the improvement of the boat. I considered it my boat, though in reality it was not. These fellow sailors also assumed I was ‘Maggie May’s’ new owner. What really mattered to the French sailing community was that the sloop was being loved and was now beginning to look less like a skip and more like a yacht. One day, I decided to go for a sail. It was high water on a spring tide. Following some good sailing off the coast, I returned home under engine, sails stowed. We traversed beyond the head land of a small peninsular, topped with a stone cross – known locally as Point de Trouquetet. The light was failing and evening fog settled as night drew on. With Binic astern, ‘Maggie May’ headed towards St Quay Potreux on the way back to the mooring. I heard the engines of another vessel, but could see nothing in the mist of the evening light. I strained to see ahead. Suddenly there it was, a large old rusty steel coasting vessel headed straight for my boat only yards away. I slammed the tiller hard over to starboard. Inexplicably, he altered course to port. Within seconds we collided. My yacht bounced along a steel rubbing strake down the ship’s starboard side. I cut my engine and waited. I could hear the noise of his propellers disappearing into the gloom. Having way on, I peered into the mist over the stern, refusing to believe he had hit and run. I turned to face the way ‘Maggie May’ was going. There, right in my path, was a steel pole atop a concrete pillar, jutting out of the sea. Instinctively, my hand threw the tiller over to port. Too late, the sloop scraped down the side of the navigation marker (which was for isolated danger and was topped by two black balls called L’Ours Seur) with a sickening crunching sound from the portside as my boat slowed with the impact. The following day, I inspected both sides of the boat. A gauge mark had been left at the widest part of the tumble home on the port side stained by bits of old concrete. A shallow groove had been left after the collision with the ship for about a length of three feet. I felt entirely at fault, regardless of the other vessel’s failure to stop. I felt I had to repair and make good the damage which stood out for everyone to see. It did not take me long to fill, fair and sand the gauge marks. On a warm day, I painted over the repaired strips in a band from stem to stern on both sides of the yacht in an off-white colour which nearly matched the original. Then the idea occurred to me. Why not put a rubbing strake centrally down each side of the yacht to protect the boat from future mishap. Less than a month later, I returned from England with a heavy-duty brown plastic ‘D’ sectioned purpose-built rubbing strake. After a day of effort, I was no further forward with the installation, having made a pig’s ear of every attempt to begin screwing the strake to the hull. I went to my berth that night dispirited, dreading a repeat of the day’s failure. The next day an ancient looking wooden gaff rigged vessel, sporting the flag of France, the Tricolour, sailed by. 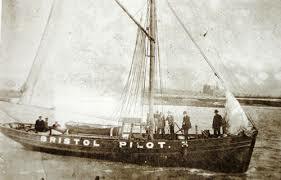 It was not unlike a Bristol Pilot Cutter. This old wooden craft towed what looked like an archaic flat-bottomed, double ended, wooden skiff with a blue painted hull. At the helm of the vessel stood a grizzled looking old man with a dirty old woollen hat reminiscent of fishermen from those parts. An hour later, as I struggled with the writhing brown plastic snake-like rubbing strake, the blue coloured skiff appeared. The skiff’s approach took me by surprise as I normally expect to hear the noise of an outboard engine accompany a tender. The skiff came upon me in silence. It was powered by the old man, who stood facing the skiff’s stern. He used a single wooden oar to scull the craft with the oar lodged over the skiff’s stern between two wooden pegs. The skiff’s course made for my boat. I attempted to secure the rubbing strake down my yacht’s side. He came closer and I realised he had come to assist. He stood barefoot, ankle-deep in water in the skiff. The old man’s mouth uttered strange words, heavy with dialect in a slow French accent. I understood nothing of what he said, attempting to politely introduce myself in my broken school boy French. There was a glint in the old man’s eyes. Looking past me, he manoeuvred the skiff between my inflatable dinghy and ‘Maggie May’. Gently but firmly he pushed me out-of-the-way. Taken aback, attempting to greet him politely, I gave ground allowing him full access to the rubbing strake. Pulling fine twine from a bag the old man-made several loops hanging them from ‘Maggie May’s’ guard rails. Next, he pointed to a choice of positions as his eyes caught mine in a miming sort of manner, awaiting my approval as to how high above the water the strake should go. I nodded approval. He threaded the entire length of the rubbing strake through the loops after adjusting them to the height I had indicated. In this way the lengths of strake to be attached simply lay at repose, hanging down the side of the boat, while he progressively screwed the strake to the hull, removing the twine hangers as he secured it. Unfamiliar though he clearly was with the sloop’s fibreglass sides, the old man soon got the measure of this, to him, unusual material. Pulling an old well-worn hand brace and bit from a sack resting on the skiff’s thwart he drilled into the hull of my yacht. Without the aid of any measuring device he would scan from time to time, by eye, along the boat’s length as, foot by foot, the rubbing strake was secured into position. The only contribution I made, apart from handing him tools, was to run two lines of white Sykaflex mastic along the upper and lower bearing surfaces – and around each hole about to be secured – of the rubbing strake. Indeed, under the sunshine of those three days spent assisting my benefactor a casual observer would be forgiven for thinking I was the apprentice assisting a skilled master. One day, in my haste not to hamper the old man’s progress, I put the mastic gun down without releasing the spring-loaded piston. Mastic oozed out onto his skiff’s thwart near his tool bag leaving what looked like a white ‘tick’ where someone might sit. The mastic had set in the warmth of the sunshine before I became aware of my mistake, leaving the tick visible even after my efforts to remove it. Often, I would bail the skiff like fury when the water level reached the middle of our calves. Many times, perhaps because of the lack of spoken communication between us, the aged skilled artisan would stop to top up his pipe with tobacco. The tobacco resembled browny black stringy bladder wrack seaweed with a distinct nauseas smell. The few teeth he had were revealed when he smiled or exhaled smoke. These teeth resembled brown stained pegs set in black gums. I learned not to inhale too close to his face as his breath was even more foul than the evil exhalations from his pipe. Aware of the state of his teeth, I prepared a stew from tinned ‘Irish Stew’ adding diced broccoli and haricot verts, green beans which I happened to have aboard. I added more stew to the pan as each day passed. He liked my offering very much as he washed it down with beer. In this way, the third day saw the completion of the installation. I rowed a little distance from the yacht in my dinghy expecting to see the line of the rubbing strake wander unevenly down the vessel’s hull. Yet it was as straight as if lined up with a modern laser level light! A strange comb like object was taken from his tool bag, resembling the metal toothed curry comb used in grooming horses. This device had a handle of wood with a patina of sweat well-worn from years of use. Unlike a curry comb this tool had many rust encrusted needles of steel bent at ninety degrees. Each needle was razor sharp and stiff and twanged as it snagged the surface of the plastic. The man dug it into the curved surface of the rubbing strake pulling the tool along under steady pressure. With what looked like ease, he scratched each rubbing strake down its entire length with this tool. The ease of his efforts belied the skill and experience and the power and control the old man brought to bear. Not long after, the rubbing strakes’ plastic outer surfaces could not be distinguished from wood as these scratchings resembled the grain of wood. I had over the previous days attempted to offer payment for this old man’s labours, but the look in his eyes and the set of his flabby chin made it clear that he would not accept any payment. Having washed down his stew with a glass of beer at the end of the third day he waved goodbye as he sculled the skiff away to his craft, anchored just out of sight around a bend in the river. A week later, I enquired of the old man and his traditional old wooden sail boat. Later still, I visited boat yards, marinas and jetties and even private islands near to the river’s mouth. Over several weeks, I cast my search further afield to fishing boats and even to the stone jetties of Le Legue. No one had heard of, or seen, such a man or his craft. One day, months later, in Le Legue, I was browsing along the old stone jettied boulevard, adjacent to the lock gated section of the river, where many types of sailing boats nestled below the viaduct of the overhead motor road. I came across a model boat workshop displaying in its dusty window models of traditional Breton sailing craft. There in the window sat an exact replica of the blue skiff. The model was not for sale. The label beside the model read, ‘Model of work boat as used in Napoleonic times’. Beneath the dust could clearly be seen a small white tick in mastic on the model’s thwart! !